You’re on your way to your first camping trip after your trailer has been in storage for the winter. All is good until you hear a loud “pop” and you realize that one of your tires on your trailer has blown. The tires were new only 13,000 miles ago, so why should one go bad? After all, the tires on your car last at least 40,000 miles. So how long should your trailer tires last? Keep in mind that your trailer sits a lot, is subject to direct sunlight, and maybe you may not check the tire pressure that often. All reasons for your tires to fail. Most RV shops suggest that tires are limited more by time than by mileage. Just think of all of the weight on your trailer tires and the rough roads they are subject to. 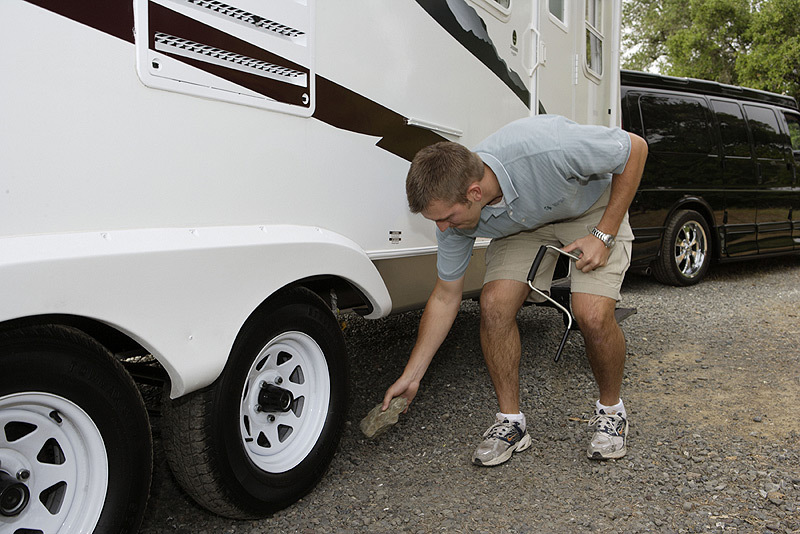 Probably the rule of thumb for RV tires is to replace them about every 3-5 years. Usually most people look at tread wear in deciding whether a tire is worn or not. Yes, tread wear will be a good indicator whether to replace a tire or not. However, sidewall condition may be even more important. If you see any cracks on your tire side walls, it is time to replace them. Most of the time tire stores suggest that you replace your tires in pairs vs. one at a time. So before driving your motor home to your favorite National Park or towing your trailer/fifth wheel to that great RV park by the lake; check all the tires on your rig. You will be much happier replacing tires at your local tire store vs. calling for road service out in the middle of now where. Don’t let your tires ruin your camping trip. Most of all, the safety of you and your family are the most important thing to consider when wondering if your tires will last another camping season or not.